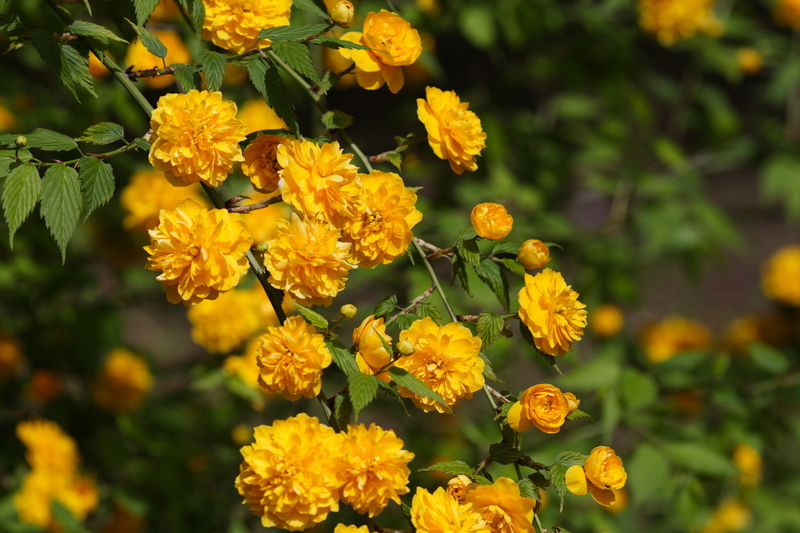 Kerria japonica is a shrub to 2 m tall, stems green, faintly striped by vascular bundles, glossy. Leaves alternate, new leaves with pair of small, linear deciduous stipules at base of petiole; petiole to 1.5 cm, blade to 5 cm long, lance to egg-shaped, tip long-pointed, base blunt, margin doubly toothed, veins impressed above, surface puckered. Flowers bright yellow, to 4.5 cm diam., at ends of lateral branches, on new growth the species is 5-petaled, but the common cultivar ‘pleniflora’, is double-flowered with all the anthers converted to petals (pompom-like), April-May. Fruit (if any) dry (Rehder 1986; Dirr 1990). Habitat: Overgrown plantings or horticultural. Cultivar probably sterile, not escaping.